This article is about the former Yahoo CEO. For the novelist, see Marissa Meyer. Marissa Ann Mayer (/ˈmaɪ.ər/; born May 30, 1975) is an American information technology executive, and co-founder of Lumi Labs. 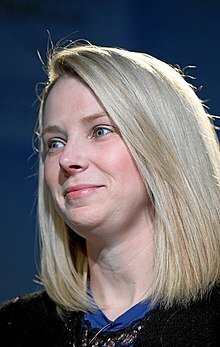 Mayer formerly served as the president and chief executive officer of Yahoo!, a position she had held starting July 2012. It was announced in January 2017 that she would step down from the company's board upon the sale of Yahoo! 's operating business to Verizon Communications for $4.8 billion. She would not join the newly combined company, now called Verizon Media (formerly Oath), and announced her resignation on June 13, 2017. She is a graduate of Stanford University and was a long-time executive, usability leader, and key spokeswoman for Google (employee #20). Mayer was born in Wausau, Wisconsin, the daughter of Margaret Mayer, an art teacher of Finnish descent, and Michael Mayer, an environmental engineer who worked for water companies. Her grandfather, Clem Mayer, had polio when he was 7 and served as mayor of Jackson, Wisconsin, for 32 years. She has a younger brother. She would later describe herself as having been "painfully shy" as a child and teenager. She "never had fewer than one after-school activity per day," participating in ballet, ice-skating, piano, swimming, debate, and Brownies. During middle school and high school, she took piano and ballet lessons, the latter of which taught her "criticism and discipline, poise, and confidence". At an early age, she showed an interest in math and science. When she was attending Wausau West High School, Mayer was on the curling team and the precision dance team. She excelled in chemistry, calculus, biology, and physics. She took part in extracurricular activities, becoming president of her high school's Spanish club, treasurer of the Key Club, captain of the debate team, and captain of the pom-pom squad. Her high school debate team won the Wisconsin state championship and the pom-pom squad was the state runner-up. During high school, she worked as a grocery clerk. After graduating from high school in 1993, Mayer was selected by Tommy Thompson, then the Governor of Wisconsin, as one of the state's two delegates to attend the National Youth Science Camp in West Virginia. Intending to become a pediatric neurosurgeon, Mayer took pre-med classes at Stanford University. She later switched her major from pediatric neuroscience to symbolic systems, a major which combined philosophy, cognitive psychology, linguistics, and computer science. At Stanford, she danced in the university ballet's Nutcracker, was a member of parliamentary debate, volunteered at children's hospitals, and helped bring computer science education to Bermuda's schools. During her junior year, she taught a class in symbolic systems, with Eric S. Roberts as her supervisor. The class was so well received by students that Roberts asked Mayer to teach another class over the summer. Mayer went on to graduate with honors from Stanford with a BS in symbolic systems in 1997 and an MS in computer science in 1999. For both degrees, her specialization was in artificial intelligence. For her undergraduate thesis, she built travel-recommendation software that advised users in natural-sounding human language. In 2009, the Illinois Institute of Technology granted Mayer an honoris causa doctorate degree in recognition of her work in the field of search. Mayer interned at SRI International in Menlo Park, California, and Ubilab, UBS's research lab based in Zurich, Switzerland. She holds several patents in artificial intelligence and interface design. After graduating from Stanford, Mayer received 14 job offers, including a teaching job at Carnegie Mellon University and a consulting job at McKinsey & Company. She joined Google in 1999 as employee number 20. She started out writing code and overseeing small teams of engineers, developing and designing Google's search offerings. She became known for her attention to detail, which helped land her a promotion to product manager, and later she became director of consumer web products. She oversaw the layout of Google's well-known, unadorned search homepage. She was also on the three-person team responsible for Google AdWords, which is an advertising platform that allows businesses to show their product to relevant potential customers based on their search terms. AdWords helped deliver 96% of the company's revenue in the first quarter of 2011. In 2002, Mayer started the Associate Product Manager (APM) program, a Google mentorship initiative to recruit new talents and cultivate them for leadership roles. Each year, Mayer selected a number of junior employees for the two-year program, where they took on extracurricular assignments and intensive evening classes. Notable graduates of the program include Bret Taylor and Justin Rosenstein. 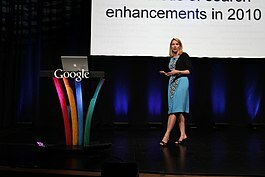 In 2005, Mayer became Vice President of Search Products and User Experience. Mayer held key roles in Google Search, Google Images, Google News, Google Maps, Google Books, Google Product Search, Google Toolbar, iGoogle, and Gmail. Mayer was the vice president of Google Search Products and User Experience until the end of 2010, when she was asked by then-CEO Eric Schmidt to head the Local, Maps, and Location Services. In 2011, she secured Google's acquisition of survey site Zagat for $125 million. While Mayer was working at Google, she taught introductory computer programming at Stanford and mentored students at the East Palo Alto Charter School. She was awarded the Centennial Teaching Award and the Forsythe Award from Stanford. On July 16, 2012, Mayer was appointed president and CEO of Yahoo!, effective the following day. She is also a member of the company's board of directors. To simplify the bureaucratic process and "make the culture the best version of itself", Mayer launched a new online program called PB&J. It collects employee complaints, as well as their votes on problems in the office; if a problem generates at least 50 votes, online management automatically investigates the matter. In February 2013, Mayer oversaw a major personnel policy change at Yahoo! that required all remote-working employees to convert to in-office roles. Having worked from home toward the end of her pregnancy, Mayer returned to work after giving birth to a boy, and built a mother's room next to her office suite—Mayer was consequently criticized for the telecommuting ban. In April 2013, Mayer changed Yahoo! 's maternity leave policy, lengthening its time allowance and providing a cash bonus to parents. CNN noted this was in line with other Silicon Valley companies, such as Facebook and Google. Mayer has been criticized for many of her management decisions in pieces by The New York Times and The New Yorker. On May 20, 2013, Mayer led Yahoo! to acquire Tumblr in a $1.1 billion acquisition. In February 2016, Yahoo! acknowledged that the value of Tumblr had fallen by $230 million since it was acquired. In July 2013, Yahoo! reported a fall in revenues, but a rise in profits compared with the same period in the previous year. Reaction on Wall Street was muted, with shares falling 1.7%. In September 2013, it was reported that the stock price of Yahoo! had doubled over the 14 months since Mayer's appointment. However, much of this growth may be attributed to Yahoo! 's stake in the Chinese e-commerce company Alibaba Group, which was acquired before Mayer's tenure. In November 2013, Mayer instituted a performance review system based on a bell curve ranking of employees, suggesting that managers rank their employees on a bell curve, with those at the low end being fired. Employees complained that some managers were viewing the process as mandatory. In February 2016, a former Yahoo! employee filed a lawsuit against the company claiming that Yahoo's firing practices have violated both California and federal labor laws. In 2014, Mayer was ranked sixth on Fortune's 40 under 40 list, and was ranked the 16th most-powerful businesswoman in the world that year according to the same publication. In March 2016 Fortune would name Mayer as one of the world's most disappointing leaders. Yahoo! stocks continued to fall by more than 30% throughout 2015, while 12 key executives left the company. In December 2015, the New York-based hedge fund SpringOwl, a shareholder in Yahoo Inc., released a statement arguing that Mayer be replaced as CEO. Starboard Value, an activist investing firm that owns a stake in Yahoo, likewise wrote a scathing letter regarding Mayer's performance at Yahoo. By January 2016, it was further estimated that Yahoo! 's core business has been worth less than zero dollars for the past few quarters. In February 2016, Mayer confirmed that Yahoo! was considering the possibility of selling its core business. In March 2017, it was reported that Mayer could receive a $23 million termination package upon the sale of Yahoo! to Verizon. Mayer announced her resignation on June 13, 2017. In spite of large losses in advertising revenue at Yahoo! and a 50% reduction in staff during her 5 years as CEO, Mayer was paid a total of $239 million over that time, mainly in stock and stock options. On the day of her resignation, Mayer publicly highlighted many of the company's achievements during her tenure, including: creating $43B in market capitalization, tripling Yahoo stock, growing mobile users to over 650 million, building a $1.5B mobile ad business, and transforming Yahoo's culture. On 8 November 2017, along with several other present and former corporate CEOs; Mayer testified before the United States Senate Committee on Commerce, Science, and Transportation regarding major security breaches at Yahoo during 2013 and 2014. Scott Ard, a prominent editorial director, fired from Yahoo! in 2015, filed a lawsuit alleging that "Mayer encouraged and fostered the use of (an employee performance-rating system) to accommodate management’s subjective biases and personal opinions, to the detriment of Yahoo!’s male employees." He claimed that, prior to his firing, he had received "fully satisfactory" performance reviews since starting at the company in 2011 as head of editorial programming for Yahoo! 's home page; however, he was relieved of his role, which was given to a woman who had been recently hired. This case was dismissed in March 2018. An earlier lawsuit was filed by Gregory Anderson, who was fired in 2014, alleging the company’s performance management system was arbitrary and unfair and disguised layoffs as terminations for the purpose of evading state and federal WARN Acts, making it the first WARN Act and gender discrimination lawsuit Yahoo! and Mayer faced in 2016. After leaving Yahoo! in 2017, Mayer started Lumi Labs with former colleague Enrique Munoz Torres. The company is based in Palo Alto and is focused on artificial intelligence and consumer media. As well as sitting on the boards of directors of Walmart and Jawbone, Mayer also sits on several non-profit boards, such as Cooper–Hewitt, National Design Museum, New York City Ballet, San Francisco Ballet, and San Francisco Museum of Modern Art. Mayer actively invests in technology companies, including crowd-sourced design retailer Minted, live video platform Airtime.com, wireless power startup uBeam, online DIY community/e-commerce company Brit + Co., mobile payments processor Square, home décor site One Kings Lane, genetic testing company Natera, and nootropics and biohacking company Nootrobox. Mayer was named to Fortune magazine's annual list of America's 50 Most Powerful Women in Business in 2008, 2009, 2010, 2011, 2012, 2013, and 2014 with ranks at 50, 44, 42, 38, 14, 8 and 16 respectively. In 2008, at age 33, she was the youngest woman ever listed. Mayer was named one of Glamour Magazine's Women of the Year in 2009. She was listed in Forbes Magazine's List of The World's 100 Most Powerful Women in 2012, 2013 and 2014, with ranks of 20, 32 and 18 respectively. In September 2013, Mayer became the first CEO of a Fortune 500 company to be featured in a Vogue magazine spread. In 2013, she was also named in the Time 100, becoming the first woman listed as number one on Fortune magazine's annual list of the top 40 business stars under 40 years old. Mayer made Fortune magazine history in 2013, as the only person to feature in all three of its annual lists during the same year: Businessperson of the Year (No. 10), Most Powerful Women (at No. 8), and 40 Under 40 (No. 1) at the same time. In March 2016, Fortune then named Mayer as one of the world's most disappointing leaders. On 24 December 2015, Mayer was listed by UK-based company Richtopia at number 14 in the list of 500 Most Influential CEOs. Mayer appeared on the List of women CEOs of Fortune 500 companies in 2017, having ranked 498 of the top 500 Fortune 500 company CEOs. Mayer married lawyer and investor Zachary Bogue on December 12, 2009. On the day Yahoo! announced her hiring, Mayer revealed that she was pregnant; she gave birth to a baby boy on September 30, 2012. Although she asked for baby name suggestions via social media, she eventually chose the name Macallister from an existing list. On December 10, 2015, Mayer announced that she had given birth to identical twin girls, Marielle and Sylvana. Mayer is Lutheran, but she has said—referencing Vince Lombardi's "Your God, your family and the Green Bay Packers"—that her priorities are "God, family and Yahoo!, except I'm not that religious, so it's really family and Yahoo!." ^ Edwards, Jim (September 2, 2015). "Look Inside The $30 Million Mansion Yahoo's Marissa Mayer Just Bought". SFGate. Retrieved July 2, 2017. ^ "Marissa Mayer's House, Palo Alto, California (CA), US". Retrieved July 2, 2017. ^ "Lumi Labs Home Page". Lumi Labs. Retrieved December 29, 2018. ^ Miguel Helft. "Marissa Mayer". Forbes. ^ "Yahoo CEO Marissa Mayer and Warner Music Group COO Robert Wiesenthal Joining Jawbone's Board of Directors" (PDF). Jawbone. May 1, 2013. Retrieved October 2, 2014. ^ "Walmart Board of Directors Nominates New Candidate: Marissa Mayer to stand for election at Walmart's 2012 Annual Shareholders' Meeting". Bloomberg. Bloomberg LP. April 16, 2012. Retrieved December 26, 2014. ^ Singer, Sally (December 14, 2009). "The Bride Wore Snowflakes". Vogue. Retrieved August 26, 2012. ^ Lopez, Napier (2017-01-10). "Yahoo renamed 'Altaba' as CEO Marissa Mayer resigns from board". The Next Web. Retrieved 2017-01-10. ^ a b "The rise and fall of Marissa Mayer, from the once-beloved CEO of Yahoo to a $4.48 billion sale to Verizon". Business Insider. Retrieved 2018-03-28. ^ La Monica, Paul R. (13 June 2017). "Marissa Mayer leaves Yahoo with nearly $260 million". CNNMoney. Retrieved June 13, 2017. ^ Mayer, M. (2008). "Innovation, design, and simplicity at google". ACM SIGCSE Bulletin. 40: 199. doi:10.1145/1352322.1352205. ^ a b Holson, Laura (March 1, 2009). "Putting a Bolder Face on Google". The New York Times. p. BU-1. ^ Stone, Brad (July 16, 2012). "Marissa Mayer Is Yahoo's New CEO". Bloomberg Businessweek. Retrieved August 26, 2012. ^ Jännäri, Jenny (November 9, 2011). "Google-johtaja vieraili Suomessa sukujuurillaan". Kauppalehti. Retrieved July 16, 2012. English title: "Google vice president visits the land of her ancestors". ^ a b c d e Weisberg, Jacob (August 16, 2013). "Yahoo's Marissa Mayer: Hail to the Chief". Vogue. Archived from the original on August 23, 2013. Retrieved August 24, 2013. ^ "Marissa Mayer: The Talent Scout". Businessweek. June 18, 2006. Retrieved August 8, 2012. ^ Chernin, Andrew (January 16, 2010). "La mujer fuerte de Google". Qué Pasa. Quepasa. Archived from the original on October 31, 2012. Retrieved August 8, 2012. ^ "Marissa Mayer" From Finland to Yahoo!". MyHeritage. July 18, 2012. Retrieved October 9, 2014. ^ Hrodey, Matt (May 14, 2013). "Mighty Mayer". Milwaukee Mag. Retrieved October 9, 2014. ^ a b c d e f g h Carlson, Nicholas (August 24, 2013). "The Truth About Marissa Mayer: An Unauthorised Biography". Business Insider. Archived from the original on August 25, 2013. Retrieved October 1, 2014. ^ McLean, Bethany (January 2014). "Yahoo's Geek Goddess". Vanity Fair. Retrieved October 9, 2014. ^ Rodriguez, Salvador (July 16, 2012). "Look back at Marissa Mayer's 2011 Los Angeles Times interview". Los Angeles Times. Retrieved October 9, 2014. ^ "Did You Know?" (PDF). WSD Dialogue. Wausau School District. Spring 2010. p. 11. Retrieved August 26, 2012. ^ Nalley, Steven (June 28, 2012). "Wang attends National Youth Science Camp". Starkville Daily News. Archived from the original on July 20, 2012. Retrieved July 16, 2012. ^ a b c d Perry, Tekla S. (March 30, 2012). "Marissa Mayer: Google's Chic Geek". IEEE Spectrum. Retrieved October 1, 2014. ^ a b c Leahey, Colleen (December 1, 2011). "Google's Marissa Mayer: How I got ahead". Fortune. Retrieved October 1, 2014. ^ a b c Singer, Sally (March 28, 2012). "From the Archives: Google's Marissa Mayer in Vogue". Vogue. Retrieved October 2, 2014. ^ "Marissa Mayer '97 becomes CEO of Yahoo". The Stanford Daily. July 19, 2012. Retrieved October 1, 2014. ^ "Google VP Marissa Mayer to Address 2009 IIT Graduates". IIT Media Room. Illinois Institute of Technology. March 25, 2009. Retrieved May 16, 2009. ^ "IIT Media Room". Iit.edu. May 18, 2009. Retrieved June 14, 2013. ^ Sutter, John D. (July 17, 2012). "Know Yahoo's Marissa Mayer in 11 facts". CNN. Retrieved October 9, 2014. ^ "Yahoo! Appoints Marissa Mayer Chief Executive Officer". Business Wire. July 16, 2012. Retrieved October 10, 2014. ^ Sloan, Paul (July 16, 2012). "Google's Marissa Mayer becomes Yahoo CEO". CNET. Retrieved August 26, 2012. ^ Guglielmo, Connie (July 16, 2012). "Google's Page Says Mayer Will Be Missed; HP's Whitman Welcomes Yahoo's New CEO". Forbes. Retrieved August 26, 2012. ^ a b Miller, Lisa (October 7, 2012). "Can Marissa Mayer Really Have It All?". New York Magazine. Retrieved October 9, 2014. ^ a b Tischler, Linda (November 1, 2005). "THE BEAUTY OF SIMPLICITY". The Fast Company. Retrieved October 9, 2014. ^ Sorkin, Andrew Ross; Rusli, Evelyn M (July 16, 2012). "A Yahoo Search Calls Up a Chief From Google". The New York Times. Retrieved August 26, 2012. ^ Levy, Steven (2011). "Part Four: Google's Cloud". In the Plex: How Google Thinks, Works, and Shapes Our Lives. Simon & Schuster. ISBN 978-1-4165-9658-5. ^ a b Thomas, Owen (July 23, 2012). "MARISSA'S MARVELS: The Graduates Of Her Google Genius School". Business Insider. Retrieved October 7, 2014. ^ "Marissa Mayer". Fortune. Retrieved October 9, 2014. ^ Guthrie, Julian (February 8, 2008). "The adventures of Marissa". San Francisco Magazine. Archived from the original on October 9, 2014. Retrieved October 9, 2014. ^ Miller, Claire Cain (October 12, 2010). "At Google, Mayer Takes a New Job". The New York Times Bits Blog. Retrieved August 26, 2012. ^ "Marissa Mayer". Stanford University's Entrepreneurship Corner. Retrieved October 1, 2014. ^ Chang, Andrea (July 16, 2012). "Google executive Marissa Mayer named Yahoo's new chief executive". Los Angeles Times. Retrieved August 26, 2012. ^ Oreskovic, Alexei; Lauria, Peter (July 16, 2012). "Yahoo snags Google's Mayer as CEO in surprise hire". MSNBC. Reuters. Retrieved July 18, 2012. ^ Sellers, Patricia (October 22, 2013). "How Yahoo CEO Mayer fixed 1,000 problems – Postcards". Fortune. Retrieved July 19, 2018. ^ "Why Marissa Mayer Told Remote Employees To Work in an Office ... Or Quit". Business Insider. February 24, 2013. Retrieved February 24, 2013. ^ Guynn, Jessica (February 26, 2013). "Yahoo CEO Marissa Mayer causes uproar with telecommuting ban". latimes.com. Retrieved June 14, 2013. ^ Carlson, Nicholas (April 30, 2013). "Marissa Mayer Doubles Yahoo's Paid Maternity Leave, Gives Dads Eight Weeks Off". Business Insider. Retrieved June 14, 2013. ^ Pepitone, Julianne (April 30, 2013). "Marissa Mayer extends Yahoo's maternity leave – CNNMoney – Apr. 30, 2013". Money.cnn.com. Retrieved June 14, 2013. ^ McCullough, DG (August 8, 2014). "Women CEOs: Why companies in crisis hire minorities – and then fire them". The Guardian. Retrieved October 9, 2014. ^ a b Nicholas Carlson (December 17, 2014). "What Happened When Marissa Mayer Tried to Be Steve Jobs". The New York Times. Retrieved February 22, 2015. ^ a b Vauhini Vara (October 22, 2014). "Yahoo's Dynamic C.E.O. and Her Boring Plan". The New Yorker. Retrieved February 22, 2015. ^ Lublin, Joann S.; Efrati, Amir; Ante, Spencer E. (May 20, 2013). "Yahoo Deal Shows Power Shift". The Wall Street Journal. Retrieved October 10, 2014. ^ de la Merced, Michael J.; Bilton, Nick; Perlroth, Nicole (May 19, 2013). "Yahoo to Buy Tumblr for $1.1 Billion". The New York Times. Retrieved October 10, 2014. ^ "Yahoo revenue falls on slow ad sales". Bbc.co.uk. Retrieved July 18, 2013. ^ Victoria Edwards (September 21, 2013). "6 Things We Learned From Marissa Mayer and Mark Zuckerberg at TechCrunch Disrupt 2013". Search Engine Watch. Incisive Media Incisive Interactive Marketing LLC. Retrieved September 23, 2013. ^ "What Happened When Marissa Mayer Tried to Be Steve Jobs". The New York Times. December 21, 2014. ^ (Yahoo! Inc) (November 12, 2013). "Yahoo's Latest HR Disaster: Ranking Workers on a Curve". Businessweek. Retrieved November 28, 2013. ^ a b ""Because Marissa Said So" – Yahoos Bristle at Mayer's New QPR Ranking – Kara Swisher – News". AllThingsD. November 8, 2013. Retrieved November 28, 2013. ^ "A Yahoo Employee-Ranking System Favored by Marissa Mayer Is Challenged in Court". The New York Times. February 2, 2016. ^ "Fortune Most Powerful Women in Business". money.cnn.com. Retrieved November 25, 2013. ^ "Fortune Most Powerful Women in Business". Fortune. Retrieved January 14, 2015. ^ Josh Lipton (2015-10-20). "What options does Marissa Mayer have left?". Cnbc.com. Retrieved 2016-12-02. ^ "Marissa Mayer: Firing Yahoo CEO, Staff Can Save Company, Says Shareholder". Headlines & Global News. ^ Paul R. La Monica (January 6, 2016). "Hedge fund is sick of Yahoo CEO Marissa Mayer". CNNMoney. ^ Timothy B. Lee (February 2, 2016). "Yahoo is laying off 1,700 and putting itself up for sale. Here's why". Vox. ^ Hazel Sheffield (February 3, 2016). "Yahoo CEO Marissa Mayer says company is considering selling its internet business". The Independent. ^ Fiegerman, Seth (March 13, 2017). "Marissa Mayer could get $23 million severance". CNN Money. Retrieved July 2, 2017. ^ a b Baron, Ethan (June 13, 2017). "Yahoo CEO Marissa Mayer resigns, cites achievements by fallen firm as Verizon deal closes". The Mercury News. Retrieved July 5, 2017. ^ Goel, Vindu (2017-06-03). "Dissecting Marissa Mayer's $900,000-a-Week Yahoo Paycheck". The New York Times. ISSN 0362-4331. Retrieved 2017-06-03. ^ Shabbad, Rebecca "Senate panel holds hearing on Equifax, Yahoo security breaches"; CBS News; 8 Nov. 2017. ^ Justice Dept. "U.S. Charges Russian FSB Officers and Their Criminal Conspirators for Hacking Yahoo and Millions of Email Accounts"; U.S. Department of Justice; 15 March 2017. ^ Soergel, Andrew (October 7, 2016). "Lawsuit Accuses Yahoo CEO Marissa Mayer of Discrimination Against Men". U.S. News & World Report. Archived from the original on October 8, 2016. Retrieved September 21, 2017. ^ Ethan Baron. "Lawsuit: Yahoo CEO Marissa Mayer led illegal purge of male workers". Mercurynews.com. Retrieved 2016-12-02. ^ "U.S. district court dismisses Yahoo gender discrimination lawsuit". San Francisco Chronicle. 2018-03-14. Retrieved 2019-02-20. ^ "A Yahoo Employee-Ranking System Favored by Marissa Mayer Is Challenged in Court [Updated]". nytimes.com. Retrieved 2016-02-01. ^ Tong, Brian (2016-10-07). "Yahoo's Mayer sued for allegedly forcing out male employees". Cnet.com. Retrieved 2016-12-02. ^ "Why A Man Is Suing Yahoo For Sexism". The Huffington Post. 2016-02-05. Retrieved 2016-12-02. 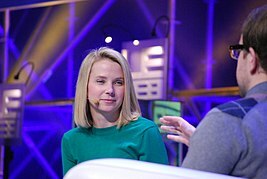 ^ "Former Yahoo CEO Marissa Mayer Creates Tech Startup Incubator". Bloomberg.com. 2018-04-19. Retrieved 2018-04-19. ^ Jeff Blagdon. "Yahoo's Marissa Mayer joins Jawbone board". The Verge. Retrieved June 14, 2013. ^ Savitz, Eric (April 16, 2012). "Wal-Mart Names Google's Marissa Mayer To Its Board". Forbes. Retrieved July 19, 2012. ^ "Yahoo's new boss Marissa Mayer could see pay top $70m". BBC. July 19, 2012. Retrieved August 26, 2012. ^ "Wal-Mart Nominates Google's Marissa Mayer to Board". Bloomberg. April 17, 2012. Retrieved September 24, 2012. ^ a b c d e f g Yarow, Jay (July 16, 2012). "Here Are The Startups New Yahoo CEO Marissa Mayer Has Invested In". Business Insider. Retrieved October 9, 2014. ^ Kelly, Heather (May 10, 2013). "Meet the 'Martha Stewart of tech'". CNN. Retrieved October 9, 2014. ^ Shambora, Jessica (February 11, 2011). "One Kings Lane: Silicon Valley's newest obsession". Fortune. Retrieved October 9, 2014. ^ "14. Marissa Mayer". 50 Most Powerful Women in Business. CNNMoney.com. October 8, 2012. Retrieved March 2, 2013. ^ Rao, Leena (November 6, 2009). "Marissa Mayer Chosen As A Glamour Magazine Woman of the Year". TechCrunch. Retrieved April 21, 2012. ^ "Yahoo CEO Marissa Mayer First Female to Top Annual 40 Under 40 List". TheWrap. Retrieved November 28, 2013. ^ "Top 500 CEOs: From Tim Cook to Justine Roberts, These Are the Most Influential CEOs in the World". Richtopia. Retrieved 22 January 2016. ^ Hinchliffe, Emma. "More women than ever lead Fortune 500 companies this year — but it's still not that many". Mashable. Retrieved 26 March 2018. ^ Bigelow, Catherine (December 23, 2009). "Google Employee No. 20 gets hitched". San Francisco Chronicle. Retrieved July 19, 2012. ^ "Marissa Mayer and Zack Bogue one of the most powerful couples". Wagcenter.com. Retrieved September 12, 2013. ^ Sellers, Patricia (July 16, 2012). "New Yahoo CEO Mayer is pregnant". Postcards. CNNMoney.com. Archived from the original on August 26, 2012. Retrieved August 26, 2012. ^ Cain Miller, Claire (July 17, 2012). "Marissa Mayer, New Yahoo Chief, Is Pregnant". The New York Times. Retrieved August 26, 2012. ^ "Google's Marissa Mayer is Yahoo CEO, says she's pregnant". The Times of India. July 18, 2012. Retrieved August 26, 2012. ^ Carlson, Nickolas. "Marissa Mayer Had A Baby Boy!". Business Insider. Retrieved October 1, 2012. ^ Gaynes, Sarah. "Waaaa-hoo! Yahoo CEO asks others to name baby". Bostonherald.com. Retrieved October 3, 2012. ^ Sellers, Patricia. "Yahoo CEO Mayer reveals her baby's name". CNN Money. Retrieved October 23, 2012. ^ "Yahoo CEO Mayer gives birth to identical twin girls, Marielle and Sylvana". Reuters. ^ Kim Grundy. "Yahoo's Marissa Mayer reveals her twins' names a month after birth". SheKnows. ^ "marissamayer on Twitter". Twitter. Retrieved 2016-04-21. ^ "Yahoo CEO Mayer's "God" and "baby is easy" quotes go viral". CNN. December 3, 2012. Retrieved December 4, 2012. ^ Benny Evangelista (November 19, 2013). "Marissa Mayer talks mobile, priorities and Vince Lombardi in protest-interupted [sic] talk at Dreamforce". SF Gate. Retrieved December 26, 2013.